Every once in a while, you stumble upon a little tip that changes your life (at least in a small way) and this holiday season I learned a fabulous one that I want to share with y'all. We all love those big red and oh so festive holiday bows- the only problem? What to do once the season is over and it is time to store the decorations away. Well a family friend provided me with this amazing tip- simply roll up plastic grocery bags and place one inside each loop in the bow. This little tip perfectly preserves bows from season to season. Eco-chic (re-using plastic grocery bags) and so effective, this tip is sure to serve you well! 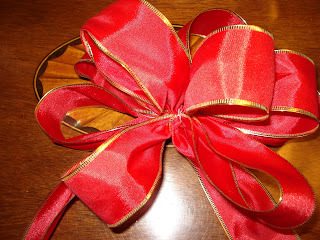 This entry was posted on 9:11 AM and is filed under Bow Preservation , Holiday Bows . You can follow any responses to this entry through the RSS 2.0 feed. You can leave a response, or trackback from your own site. What a great idea! I have some lovely bows that I'd like to use again, but would hate to have them smashed in storage. Perfect! Very innovative and a good use of those plastic bags! Hi Whitney and the cutest preppy puppy (who looks a lot like my tri-color Pepper)! 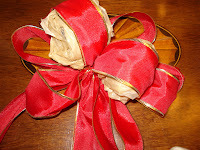 I am so excited because one of my friends taught me how to make big beautiful bows just a few weeks ago and I will happily pass along the info. I might do a little video and post it soon. Hope that you have a great day!